We were recently entrusted the honour of renovating and redoing many of the chandeliers in the stately home of Hinwick House. This was no small job! 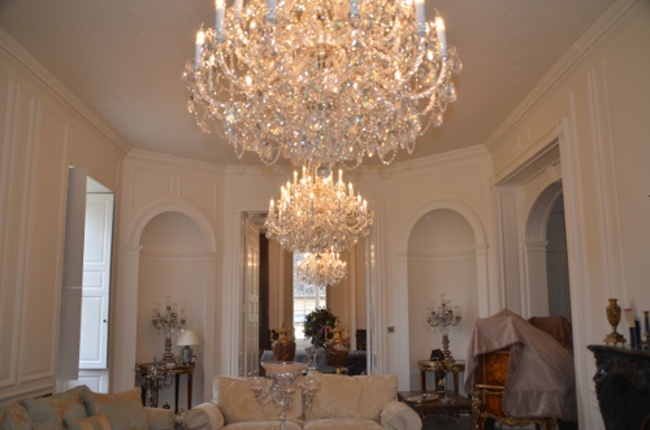 - In total we installed 11 chandeliers into the already beautiful home! 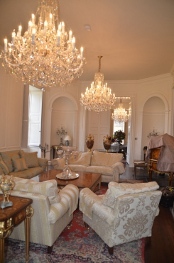 The most important task of the whole job was to ensure that the chandeliers we were installing were in keeping with the rest of the house and our aim was to ultimately help bring the home back to its former glory. Of the 11 chandeliers, there were 2 that were major jobs and needed much more attention than the others. One of the major ones was an enormous chandelier taking up and entire staircase (as you can see pictured). It was a complicated process and due to the complexity of the chandelier and the location of it, the installation involved both scaffolding and a winch system to put it up and took a total of 3 days alone! It was definitely worth it though. The end result of the chandelier is breath taking and all measures were taken to ensure it filled the space of the staircase. The customer chose the chandelier they wanted for this space, which was the perfect size for the staircase, however it wasn’t the correct height because the ceilings were much higher. In order to make sure this wasn't a problem, we added a longer chain to the top of the chandelier so that it hung at the correct height. 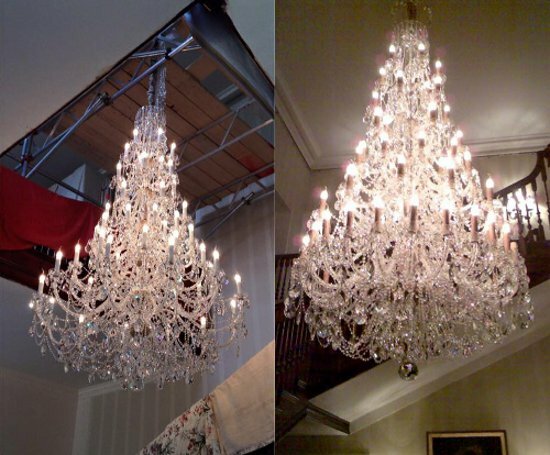 We didn’t want this to detract from the glamour and beauty of the rest of the chandelier and the customer also didn't want the chain visible from the 1st floor, so we made it look more attractive. We basically added a new top which involved producing a silk chain cover and adding crystal chains around it. The customer was very satisfied with the outcome. One final alteration that was made to the chandelier was making the bottom layer denser. The chandelier itself was made up of 54 arms in total, but the customer felt that the bottom layer of the tiers didn't look in keeping and was let down by the lack of arms and crystal in it. In order to give our customer their dream chandelier, we ordered 12 more arms for the chandelier, to add more light and more decoration. 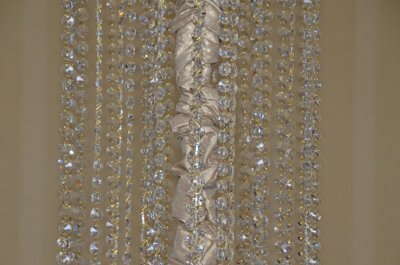 This meant that the crystal density grew making the chandelier more sparkly, brighter and exactly what the customer wanted! 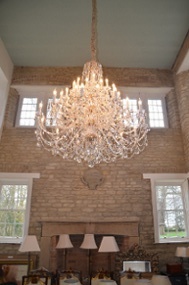 There was another chandelier that wasn't as complicated aesthetically but to mount in the ceiling was very complicated! And involved us having to go up into a very cobweb filled, tight spaced loft to make sure we found a strong bit of ceiling to obtain the perfect fixing point. The other chandeliers in the house weren't nearly as complicated as these two! They were a lot smaller in comparison and all we had to do was ensure they were in keeping with the style of the house and the other light fixtures already there (and install them). Overall, this job was a challenge but definitely not without benefits; it took just over 10 days to complete and fit all 11 chandeliers (there were some delays due to having to order extra chandelier parts in). It was so worth it all to see how all the chandeliers have turned out and look in relation to the rest of the house! They are stunning! And we hope you like them too!